I'm a fan of all brownies; fudgey, chewy, hard, sprinkled with powdered sugar, frosted with sprinkles, or even made with black beans. 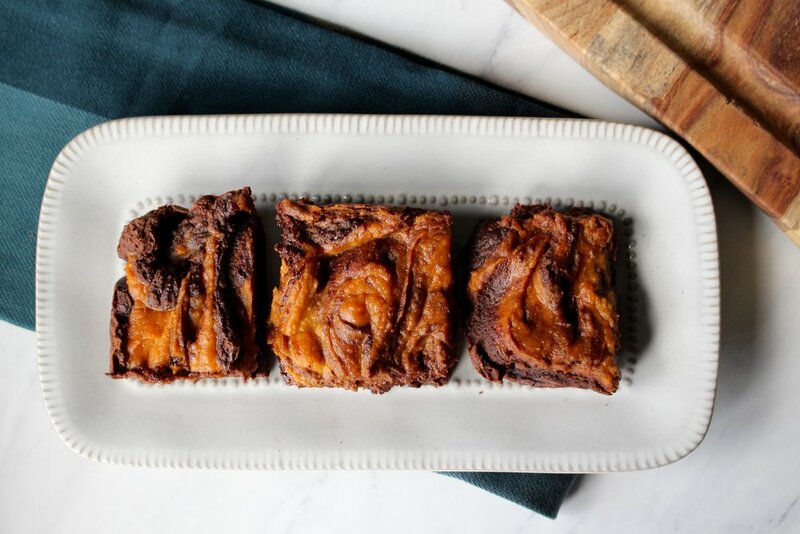 My sweet tooth has always and will always love the creamy, dreamy richness of pure chocolate that just about any brownie delivers, including black bean brownies. I almost couldn't believe my eyes, or my taste buds, when I made my first black bean brownie recipe. Low and behold, it has become one of my favorite ingredients for a perfectly soft, always fudgey, and kind of healthy batch of brownies! The base of this recipe is a tried and true favorite and can be made with or without additives and toppings. It seems like whenever I make it, Chad continuously asks me if I'm lying about the whole "black bean" part. Yes, they are really made with black beans and yes, they are really that good! For the sake of my favorite season and these unusually cold Autumn temperatures, I couldn't help but combine two of my favorite flavors: pumpkin spice and dark chocolate. 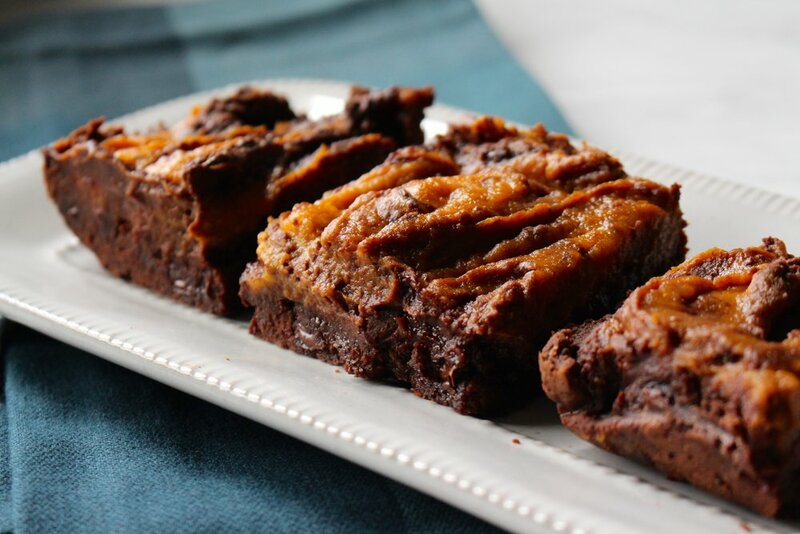 As it turns out, the flavor combination is a match made in heaven, these Pumpkin Swirl Black Bean Brownies are too good to be true! I hope you love this recipe as much as we do! These brownies are grain free, gluten free and can be made vegan with a simple swap in the sweeter of choice. As always, if you would rather enjoy the real deal, by all means go for it! But, if your in the mood for something a bit more nutrient dense, or ready to shock a crowd - these black bean brownies are perfect! Preheat the oven to 375 degrees and line a 9x9 baking dish with parchment paper, or grease generously with olive oil or butter. Using a food processor, blend black beans and eggs on high until the black beans appear smooth. Carefully add in honey, cocoa powder, coconut flour, walnuts and half of the chocolate chips. I prefer to save a few for added chunks within the batter, rather than blend completely. Blend on high, scrapping the sides from time to time, until the batter has completely combined. 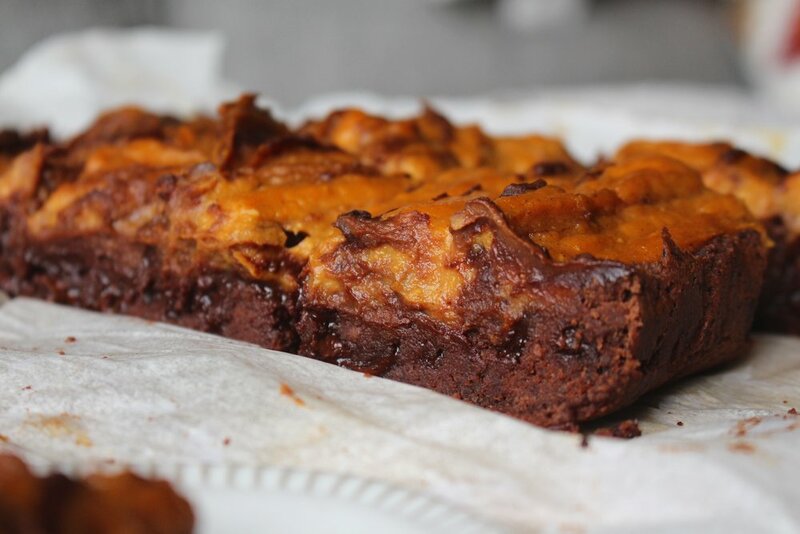 Once the batter is ready, carefully pour the batter into your baking dish and set aside to begin the pumpkin swirl. Using a mixing bowl, cream together the cream cheese, honey, and pumpkin spice. 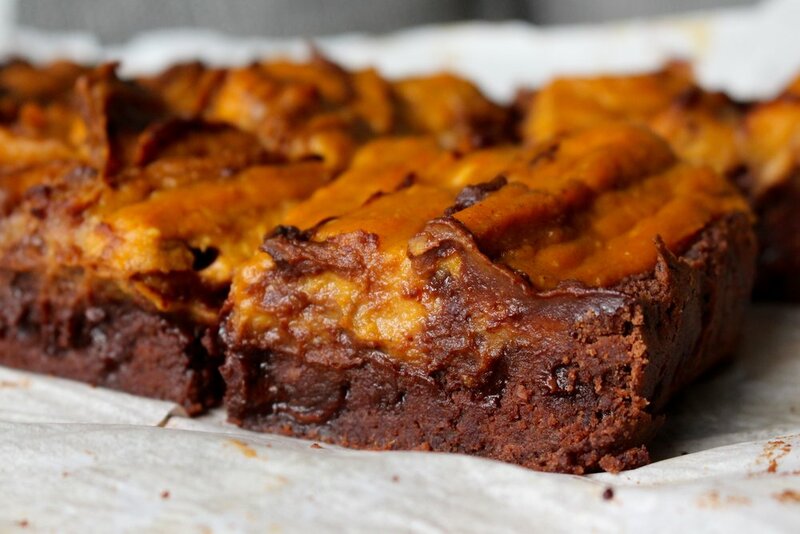 Use a spoon to drop the pumpkin batter over the brownie batter and gently "swirl" or marble the top layer (pumpkin) into the bottom layer (brownie). Be sure not to over mix or swirl - you want it to appear marbled rather than mixed! Place the baking dish in the oven and bake for 25-30 minutes. I prefer to take them out right around the 25 minute mark to leave them a little under-done/extra gooey. They will firm up once you let them cool completely. Store in an airtight container in the fridge and enjoy!